For competitions it's quite important to be able to assign players to different groups and record hole-by-hole scores for selected group. This tutorial explains different options and settings related to automatically generating and manually assigning players into groups. 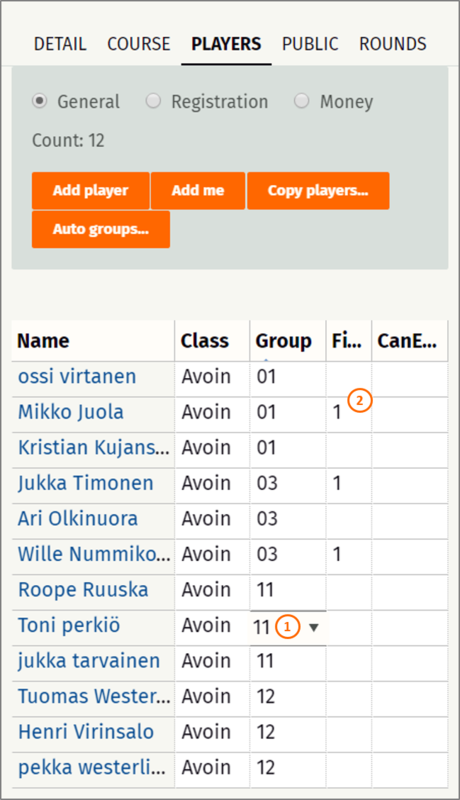 Groups can be managed manually from the players list (1) and automatically via "Auto groups..." button (2). Random - put players into groups in random order, usually good for first round. 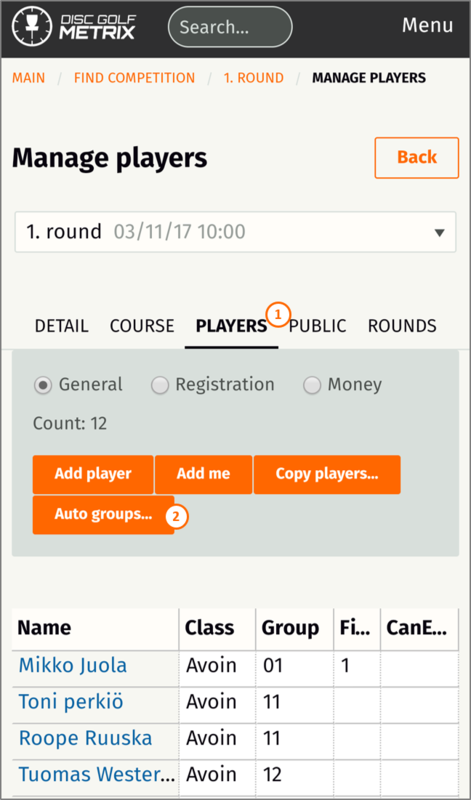 By previous rounds - arrange players into groups based on previous scores. Copy from previous round - is using exact same groups as on previous round. By rating - arrange players sorted by Metrix rating, also good for first rounds is all players have ratings. Group size is a simple selection for minimum group size. If competition has uneven number of players, some groups will have more than to minimum. Solid (golf start) - each groups will start from first basket. With this option together with "by previous rounds" the best group will be the last one. Equally or fit to course - can be used with shotgun start. This will either put one group on each tee. Or spread groups equally on the course and leave empty starting tees in the middle. Custom group numbers - can be used with shotgun start when you want groups to start from particular tees. For example: 1-9 or 1,2,3,9 or combination: 1-9,12,14-16. Divided by classes will put players in same class into same groups. Just type in the class names in preferred order separated by semicolons. Mobile phone for entering results can be used to restrict group generation based on a registration detail which defines if a player can enter scores on mobile or not. Use fixed groups can be set to Yes, if you want certain players to remain in previously defined groups during random generation. More information about fixed groups down below. Tournament director or other officials can also manage groups directly from the Players list. This is useful when making small adjustments to automatically generated groups or when assigning players to fixed groups before generating the rest. Click any of the cells to update the value. 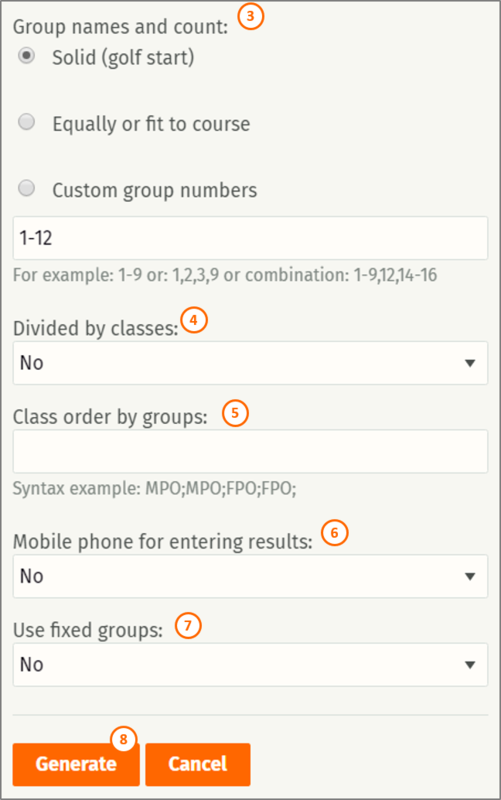 For example here you could switch Toni from group 11 to another group by selecting a different number into this cell. 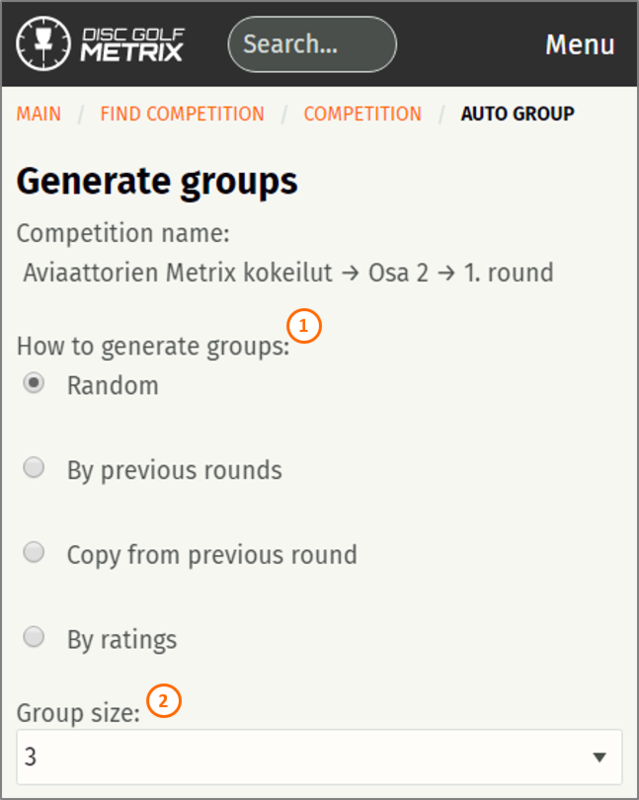 Fixed groups can be used before generating groups automatically. This only applies to "random" generation and only if the "Use fixed groups" option is selected when generating the groups. Remember to save your changes after modifying data in the table!